You are viewing the most recent posts tagged with the words: Joe Hemingmouse in the JacketFlap blog reader. What is a tag? Think of a tag as a keyword or category label. Tags can both help you find posts on JacketFlap.com as well as provide an easy way for you to "remember" and classify posts for later recall. Try adding a tag yourself by clicking "Add a tag" below a post's header. Scroll down through the list of Recent Posts in the left column and click on a post title that sounds interesting. You can view all posts from a specific blog by clicking the Blog name in the right column, or you can click a 'More Posts from this Blog' link in any individual post. As many of you know, our new Joe Hemingmouse cartoon by Peter Hannan is updated every Monday, and this week's cartoon is to the right. As always, you can click the link below this week's cartoon on our home page to leave a comment and read comments from other members. If you missed last week's debut cartoon, you can still see and comment about it. Tracie Vaughn Zimmer is the winner of a Schneider Family Book Award for Reaching for Sun! You can leave a comment on Tracie's JacketFlap profile to congratulate her. And, Yuyi Morales received the Pura Belpre Illustrator Award for Los Gatos Black on Halloween. You can leave a comment on Yuyi's JacketFlap profile to congratulate her. Congratulations to Tracie, Yuyi, and all the other winners! As you may already know, Peter created and executive produced the popular Nickelodeon animated television series CatDog and is the author and illustrator of Super Goofballs, a series of illustrated chapter books from HarperCollins. He has long wanted to write a regular cartoon about the life of a writer/illustrator. Here's what Peter said about why he's working with us on this cartoon - "After working in television with a big crew and bigger hysterics, writing and illustrating children's books is a refreshing change of pace. However, the independence can sometimes feel curiously like solitary confinement. Any creative endeavor is a series of setbacks and successes, and it's crucial to keep one's sense of humor. Luckily, I've always found my foibles, and those of friends and colleagues, funny." 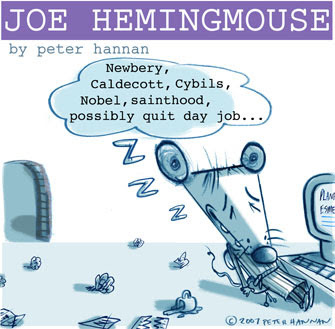 Please take a look at Joe Hemingmouse, and use the discussion link below the cartoon to let us know what you think!